Republicans need to be generous and imaginative in their approaches to the unionist community. Dialogue and engagement is the route to a shared future and republicans will necessarily be in the vanguard of this process. Republicans see engaging with unionists as a key part of their wider nation building project. And it's not about hoodwinking unionists into a united Ireland. We're quite open and honest about our political objectives and that openness and honesty is a vital component in any outreach work we undertake. During my time as the first Sinn Féin Mayor of Belfast, I was determined to forge links with the unionist communities of the city I was tasked to represent. The experience and insight gained during that time informs my continuing outreach work for the party. The office of Mayor is largely symbolic. There is no power attached. As a Minister in the Assembly you are likely to engage with people of all persuasions but that's not true for a mayor. I had to develop ways of approaching organisations, groups and individuals within the unionist community. I had to go to them. They weren't going to come to me. And the most important thing I discovered was that, unlike the public hostility associated with unionist politicians, many groups and individuals were willing, even happy to engage with republicans, albeit in a more private capacity. 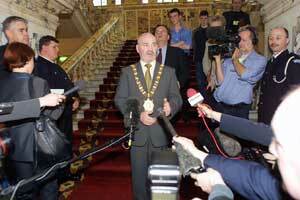 Unionist politicians often act as a barrier. Engaging with unionist communities was not always possible through their elected representatives. It was more a case of going around them. It's really important for republicans to start factoring the unionist community into their ways of thinking, their political programmes and campaigns. Many of our concerns are just as relevant to unionists as nationalists. We all face cuts in education, social services and pressure from a British Government apparently intent on clawing back core funding. It's increasingly clear we will need to work together in challenging this. And if the DUP and the political leaders of unionism remain entrenched, republicans need to find ways of working around them by addressing unionist communities directly. Republicans imagine they 'know' unionists. We sometimes assume the underlying correctness of our political and historical analysis is all we need to ensure complete understanding. This isn't really true. There are many insights to be gained by talking to real people and engaging with their experiences and perspectives. For example, a small but significant lesson for me as mayor was a realisation of the importance of symbols to unionists. For me a flag is a flag, a sticker, a sticker but I discovered such things held far more significance for many unionists. I began to understand how many people experience the loss or change of symbols as distressing, even traumatic. Now there is no getting away from the fact that many symbols and emblems associated with unionism are designed to be exclusive rather than inclusive and that will always have to be challenged but perhaps some of our own hostility to established symbols is as misplaced as unionist anxiety about changing them. And sometimes small, symbolic acts of toleration and accommodation, like the laying of a poppy wreath, sends a clearer message than endless verbal assurances. It's sometimes in the doing rather than the saying. As republicans it is paramount to break down the barriers currently existing between unionist and nationalist communities, otherwise we'll end up with some kind of separate development, a kind of apartheid and that just isn't good enough. We want a shared future of mutual respect and toleration but it won't just happen. Republicans need to find ways of developing this, of working towards this. One of the most contentious issues between nationalist and unionist communities during the current Peace Process has been the issue of Orange parades. Nationalist communities, who for decades had been forced to endure triumphalist, anti-Catholic marches forced through their districts, were absolutely right to challenge this and insist on dialogue and accommodation from unionists. Nationalists have been fairly successful in establishing their rights to object and challenge totally unacceptable aspects of Orange Order parades, such as the playing of sectarian songs, unionist paramilitary displays and sectarian abuse and violence. This will never be acceptable. But I can envisage a time, if Orangemen are prepared to engage properly with their Catholic neighbours, when nationalist communities, from a position of established strength, will be generous in their approach to Orange marches. The republican aspiration of equality and unity is not sectarian. We see the roots of our own struggle in earlier struggles that included Protestant, Catholic and Dissenter. There is no place for discrimination or repression in the republican ideal and yet our notion of the unionist community's place in the story of the Irish nation is either hostile and negative or, even when benign, totally underdeveloped and unrealistic. We founder between Connolly's notion of the carnival of reaction, in which unionism is envisaged as a counter-revolutionary scourge, or an acknowledgement of the role of Presbyterians in the United Irishmen. This is not going to be good enough for the job in hand. It's not enough to identify unionists either as the enemy within or to assure unionists that they can be republicans too. We, as republicans, need to help to find a way in which the unionists of today can envisage and understand themselves within an Irish nation of tomorrow. We need to develop a narrative of transition. It may be a narrative with which republicans aren't completely happy, a narrative that finds a place for the Orange Order and other symbols and traditions within unionism. We can only do this through dialogue and engagement.